A free train service set up to help flood-hit Cumbria will continue operating until May, the government has promised. Transport minister Sadiq Khan has announced an extra £750,000 to secure the service which was set up as a vital link for residents in Workington. Last month's flood waters devastated the area, destroying all the town's bridges, leaving residents cut off. 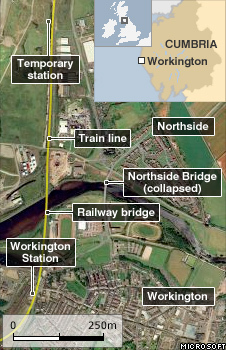 The free service links north and south Workington and travels to Maryport. 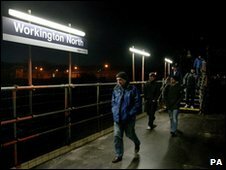 The link, which has proved popular among residents, was made possible after initial government funding of £380,000 to lease an additional train to operator Northern Rail. It had been contracted to run until the end of 2009 but will now continue and remain free of charge until Sunday 2 May 2010. Mr Khan said: "When I visited Workington I witnessed the devastation the floods had caused so I am really pleased to be able to announce this extra funding to keep this service running until next May. "These additional services have helped to reunite the two sides of the town, it has enabled residents to visit family and friends, made it easier for children to get to school and helped people to get to work. "I hope that the continuation of this service will make the lives of those affected a little easier." The funding will also allow Northern Rail to operate additional carriages on the majority of Cumbrian Coast services. A week of record rainfall hit Cumbria last month, destroying homes and businesses and claiming the life of Pc Bill Barker who died when a bridge collapsed under him.